Starring: Ray Danton, Sharon Acker, Lawrence Dane, Donnelly Rhodes, Gay Rowan, Franz Russell, Linda Sorensen. Apparently Our Man Flint: Dead On Target hasn’t been shown for 27 years. The rumours are that it was buried because it was such a stinker. It isn’t quite as bad as people make out. The problem with it though is the writer Norman Klenman (and the director for that matter) don’t appear to have watched a Coburn Flint movie – or at the very least have little respect for the source material. For example: Coburn Flint would never carry a gun – he’d consider it crude. But Danton Flint kicks down doors armed with a cannon even Dirty Harry would be proud of. What I don’t understand is why you would take the character of ‘Derek Flint’ and take away all the attributes and trappings that make Flint, Flint. (I am talking about the globe hopping high living, gourmet dining, pursuit of arts, surrounded by a bevy of beautiful girls etc…) Danton’s lifestyle seems to be very much within the grasp of you or me. Whereas Coburn Flint lived a life that I for one envied. More rumour mongering (cos I don’t know if it is true), but it is said that a third Flint film was in the works in the late sixties, called ‘Flintlock’ and a script had been prepared by Hal Fimberg, writer of the first two films. If this is true, why wouldn’t you recycle or adapt that script for Danton? The script that was used, shows nothing but contempt for the fans of the original films. Here’s a bit of a rundown. The film opens with a small cow-catcher set in San Francisco, and in particular, the offices of Southern Hemisphere Oilco. Wendle Runsler, the President of the company is handed a cup of coffee by his assistant, Ms. Carter. The cup doesn’t only hold coffee, Carter has also thrown a tablet into the mix. Runsler passes out and is spirited away in a filing cabinet by two burly goons. Then we have the title sequence. The credits run over a colourful animated background – I use the word ‘animated’ loosely because there is not much movement. Gone too is the Jerry Goldsmith score. In its place is a fat chunk of 70’s funk. To be honest the music in general isn’t too bad, but it doesn’t replace Goldsmith’s original title tune which you expect to hear. Southern Hemisphere Oilco isn’t happy about the kidnapping of their President and acquire the services of Derek Flint as an intermediary for the release. The villains of the piece are a shady outfit called B.E.S.L.A. (Ba-El-Sol Liberation Army). Ba-El-Sol is a fictitious Arabian country that has a wealth of oil. Guess which company has the oil concessions? Anyway B.E.S.L.A. has kidnapped Runsler. They want the usual type of political demands met: leader released from captivity, corrupt political leaders to resign, and two million dollars. Flint receives his instructions and returns to his home. He heads home because an alarm has gone off on his watch. As I hinted at earlier, it is far from the stylish pad that Coburn had. Apart from some garish plum coloured carpet, his home seems rather normal. Back to the break-in. It is not Flint’s enemies who have perpetrated this home invasion, but a young woman named Benita Rogers. She wants to work for Flint – be his apprentice. Without giving away the highlights of the film, as they are few and far between, what follows is a mildly amusing scene, featuring a pair of handcuffs. For a brief second it appears that Mr. Flint’s charm and style have returned, but no – it’s an anomaly. Soon after Flint is clubbed unconscious and taken to B.E.S.L.A. They re-iterate their demands and Flint is allowed to see that Runsler is still alive. Flint is knocked out once more and returned home. Next Benita contacts B.E.S.L.A. saying she wants to join their movement. A meeting is arranged and she is taken away. Flint tails her. The tracking device in his car is a particularly noisy orange light that flickers on and off. Flint loses the signal and Benita becomes another hostage. Time has been kind to this film. In the mid 70’s when it was released it may have been seen as a sloppy TV movie (which it is). But now 30 years later, it is a time capsule. It’s fun to watch the giant box like cars, listen the funky sounds and ogle at the goofy fashions…speaking of which, in Australia we have a group of children’s entertainers called The Wiggles. Apparently they are a world-wide success these days, so if you have kids, you probably know who I am talking about. For the rest of you, The Wiggles are four male singers/dancers who are coded with bright candy coloured skivvies. There is a Blue, Red, Purple and a Yellow Wiggle. 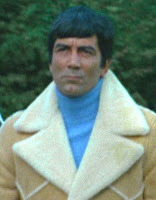 Unfortunately, Ray Danton gets lumbered with a yellow skivvy for the last third of the movie – and sorry I cannot take any hero seriously who just may burst into song with Dorothy The Dinosaur at any moment. Before I sign off, I suppose a word or two about Danton is in order. He is a little more paunchy than in his Eurospy efforts (but maybe forgivable as 10 years had passed), but he does seem decidedly uncomfortable in this role. He doesn’t seem to know how to play it. I guess times had changed. In the mid 70’s ‘camp’ was out and the quasi futurism of The Six Million Dollar Man was in. And maybe that explains the whole tone of the film. So Danton walks through the role, not sure of whether to smile or scowl. Of the Danton spy films I have looked at, this is easily the weakest, but as a curio for the Flint fans it probably is a must-see. Burying it for nearly 30 years has probably only increased it’s status as desirable viewing. (I felt that I ‘had’ to watch it!) So if you’re one of them, whatever I say will have no effect – you’ll have to watch it. Others with little or no allegiance to the Coburn Flint films can safely skip this item. “Dead On Target” is a throw-in for the DVD of “In Like Flint”. Although everything about it is Grade Z, it will be enjoyed by anyone who lived in Vancouver, Canada in the 70’s. The very first scene will seize their attention because it has the viewer looking down from a helicopter upon the West End, with the North Shore Mountains in the distance on a perfect day. See it just for the location shots. Not one minute was filmed in studio. As it is clearly wintertime and it never rains on camera, it must have been a very quickly filmed movie. The music is really very good (and sadly uncredited) while the credit roll is the worst ever seen. Allow enough time after viewing the “In Like Flint” main feature, because “Target” runs rather long. And keep your sense of humour.